OM AH HUNG BENZRA GURU PEMA SIDDHI HUNG. and used by arrangement with Shambhala Publications, Inc. Published by Buddhayana. First edition, I979; second edition, I989. that particular training will be attained. learn and practice the particular level that is suitable to his or her capacity. readers to read the original text of Mipham Rinpoche. during all their waking hours, making it as their main prayer, breathing, life, and contemplation. Because of the complex organization of the text a number of headings, subheadings and italics, and brackets have been supplied and a note of explanation may therefore be of benefit to the reader.Mipham's commentary has divided each level of interpretation of The Vajra Seven-Line Prayer into an introduction, the utterance of the seed syllable, the object of the prayer, the prayer, the mantra for invoking blessings, and (for the first level of interpretation only) the contents of the prayer. On the basis of each level of interpretation given by Mipham's commentary I have extracted a root meaning for The Vajra Seven-Line Prayer, and the reader will find that, for each level of interpretation, the root meaning is given first, followed by Mipham's commentary (with its subdivisions). "You will not be able to defeat the heretics. 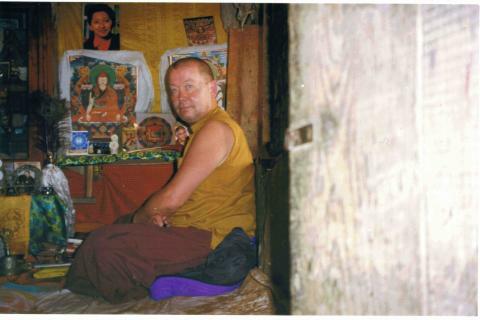 If you do not invite here my elder brother, Dorje Thöthreng Tsal (Vajra Skull-Garland Power, Guru Rinpoche), who lives at the Dark Cemetery, the Dharma will be destroyed." "How can we invite him when it is so difficult to go there?" asked the scholars. The Khadroma said: "Set up a great offering on the roof of the monastery, with music and incense, and with one voice recite the vajra prayer." And she gave them The Vajra Seven-Line Prayer. The scholars prayed accordingly, and in an instant Guru Rinpoche came miraculously from the sky. He presided over the Buddhist scholars and defeated the heretical teachers by means of textual reference and intellectual reasoning. When he was threatened by the magical powers of the heretics, he opened the casket given him by the Lion-Faced Dakini, and he found in it the mantra of "fourteen letters." [AH KA SA MA RA TSA SHA TA RA SA MA RA YA PHAT] By reciting it, he eliminated the evil ones among the heretics with a rain of lightning bolts. He caused the remaining ones to enter the Dharma. It is said that the prayer originated from that incident. Later on, when Guru Rinpoche came to Tibet in the eighth century, he gave it to the king and his subjects. Intending it for future disciples capable of training, he concealed it in many Ters. [earth or mind treasures] Later, The Vajra Seven-Line Prayer was revealed in the Ters of most of the one hundred great Tertons of the last ten centuries of the Nyingma lineage, again and again, as the heart of the prayers, teachings, and meditation. HUM -- invokes the mind of Guru Rinpoche. In the northwest of the country of Oddiyana Born on the pistil of a lotus: Endowed with the most marvelous attainment; Renowned as the Lotus-Born (Padmasambhava); Surrounded by a retinue of many Khadros [Tib. dPa' Bo, Skt. Daka (male) and Tib. mKha' 'Gro, Skt. Dakini (female) sages and deities.] Following you I practice: Please come forth to bestow blessings. Master (GURU) Padmasambhava (PEMA), please bestow (HUM) attainments (SIDDHI) [upon us]. earthly world as a manifested form (Skt. Nirmanakaya). self-arisen seed syllable of the mind of all the Buddhas. the Dhanakosha lake, filled with water of eight pure qualities. Line 2. On the stem ornamented by the pistil, leaves, and petals of a lotus, Guru Rinpoche was born. the manner of the lotus-born miraculous birth]. Line 4. 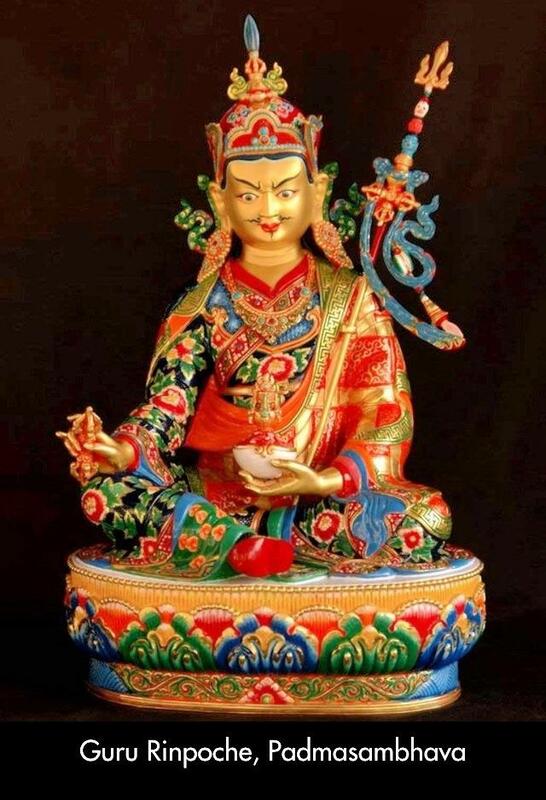 His name is renowned as the Lotus-Born (Padmasambhava). Line 5. And he is surrounded by retinues of manifold Khadros (Dakas and Dakinis). speech, and mind, as iron is transmuted into gold." GURU means master or spiritual guide, one who is prosperous with excellent qualities; to whom no one is superior. PADMA is the first part of Guru Rinpoche's name. SIDDHI is what we want to accomplish--the common and uncommon attainments. So, 0 Guru Padma, bestow the siddhi. Line 1. The place of birth. Line 2. The way of taking birth. Line 3. The greatness of his qualities. Line 4. The name of Guru Rinpoche in particular. Line 6. Praying with the aspiration of achieving inseparability from Guru Rinpoche or developing confidence in him. Line 7. Accomplishment of the inseparability of Guru Rinpoche from oneself. HUM--awakens the self-arisen wisdom, the ultimate nature. intrinsic awareness (kesar) and (la). . . This is the wisdom of the absolute nature, renowned as (zhesu trag) the ultimate basis (jungne) of the Buddhas (pema). I firmly develop confidence (dag drub kyee) in the nature of the nondual primordial wisdom (khye kyi je su). (shegsu sol) the ultimate nature. pervasive in compassion [power] (Nirmanakaya) (SIDDHI) with fivefold wisdom (HUM). wisdom, the true nature of samsara and nirvana. special source of tantra, so that is what Oddiyana means. neither remaining in nor partial to the two extremes--samsara and nirvana. dwell anywhere and is pure from the beginning, just as a lotus is unstained by any impurity. with clarity; so it resembles the pistil of a lotus. of the mind or the innate luminosity of the mind. all the Buddhas, the attainment of the supreme siddhi, the state of Vajradhara. nature; so it is renowned as the basis of Pema, the Buddhas. This is the recognition of Pema Jungne as the absolute Buddha. wisdom are emanating as its attributes ceaselessly. unchanging confidence, which is great wisdom (Shes Rab), is expressed as "I will follow after you, and I will practice." "thig-le."] of primordial wisdom (Ye Shes). powers of the instructions of the Lama and through study and reflection. conceivable characteristic, it is the supreme one, the GURU. Pa), fulfilling the wishes of all the endless beings, which is SIDDHI or attainment. HUM signifies the self-arisen primordial wisdom, the seed syllable of mind, possessor of five primordial wisdoms. HUM--awakens the self-arisen innate wisdom. the attainment of supreme siddhi (chogki ngodrub). It is renowned (zhesu trag) as the spontaneously present, absolute Padmasambhava (pema jungne). manifestating in the empty sphere (khadro) of the channels as animations (khortu). kyee) through the stages of esoteric training. of the vajra body (shegsu sol). primordial wisdom (SIDDHI), the holy Mind of the Buddhas (HUM). the path of liberation, it could be achieved through the most extraordinary trainings of the path of skillful means. The HUM syllable signifies the awakening of the self-arisen, innate primordial wisdom. Line 1. The country of Oddiyana signifies the vajra body, the extraordinary base of tantra. channel in which the moon energy (Zla Ba'i rLung) moves about, increasing, cleansing, cooling, and pacifying the essence. (Skt. avadhuti) or central channel in which the primordial wisdom energy (Ye Shes Kyi rLung) flows about. essence ('od gSal Ba'i Thig Le), which is unstained great bliss, the self-arisen primordial wisdom. and description, and it is the spontaneous accomplishment of the supreme siddhi, Vajradhara. means, the cycle of vajra body arises as the great blissful primordial wisdom of luminous essence. concentration on the subtle essences (Phra Mo'i Thig Le). Come (attain) to the Dharmakaya, the ultimate sphere of the basis. As the final result, the great primordial wisdom will be achieved swiftly; hence SIDDHI (attainment). of the Minds of the Buddhas--HUM. HUM--invokes the self-arisen wisdom that brings the realization of the face of the ultimate primordial wisdom. This attainment is renowned (zhesu trag) as the attainment of the primordial Buddhahood (pema jungne). (khortu) moving about in space (khadro). I contemplate (dag drub kyee) on the natural vision of original purity (khye kyi jesu). the expanse of primordial wisdom (chinkyee lab). This supreme (GURU), unstained (PADMA), and ultimate attainment (SIDDHI) is amazing (HUM). Zhal) could not be observed. absorption, even for us ordinary people, if we follow the instructions of this supreme yana. and inner spheres, is the water light of the eyes (rGyang Zhag Ch'u Yi sGron Ma). rNam Dag Gi sGron Ma). the ground, a container, or a house. They are both signified by the pema (lotus). Kesar (pistil) signifies the vajra chain (rDo rJe Lu Gu rGyud), which is the power of intrinsic awareness (Rig gDangs). dharmas into) the ultimate nature (Ch'os Nyid Zad Pa)--the supreme attainment, the state of Vajradhara--in this very life. is renowned as Pema Jungne." les, and small thig-les in the space. indestructible primordial wisdom to attain the rainbow vajra body of great transformation ('Ja' Lus 'Pho Ba Ch'en Po). attainment in this very lifetime (SIDDHI). Amazing (HUM)! Which is renowned (zhesu trag) as the self-arisen absolute Padmasambhava (pema jungne). I remain (dagdrub kyee) in the realized state (jesu) of effortless nature, primordial purity (khyekyi). (shegsu sol) the mandala of the primordial basis. liberation from the swamp of dualistic (gNyis sNang) appearances of samsara is very swift, like flying. Line 3. The primordial wisdom of the attainment, which is oneness and evenness, is marvelous (yatsen). ngödrub), the state of Vajradhara. mind. This attainment arises as the result of attaining (shegsu sol) the primordial basis, the ultimate truth. result itself as expounded in the teachings, and will reach the state of Vidyadhara (knowledge holder). karma, and sufferings of one's body, speech, and mind are washed away in the form of pus, blood, insects, soot, and offal. debts are cleared. At the end, one should regard them all as having vanished into emptiness. with the indestructible essence (bindu), the primordial wisdom. Then one should remain in the blissful primordial wisdom. only on the entry of the blessings of the Guru into one's own mind. achieve the fulfillment of both the temporary and the ultimate result. permission to excerpt this commentary from Enlightened Journey, by Tulku Thondup.